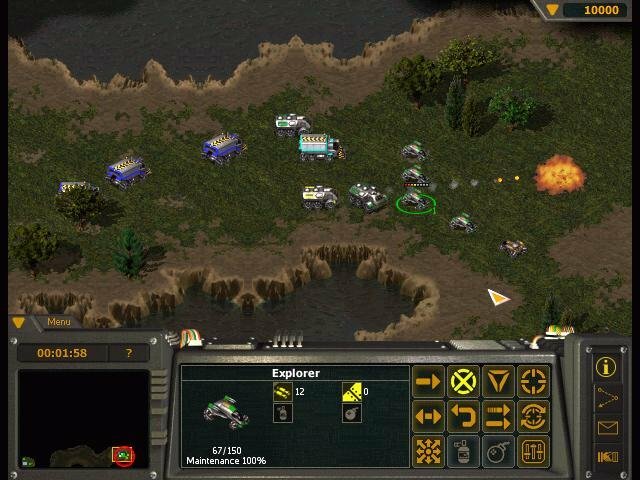 Outlive, an obscure Brazilian RTS game, had unfortunately turned up in the midst of an already over-saturated action-strategy scene. 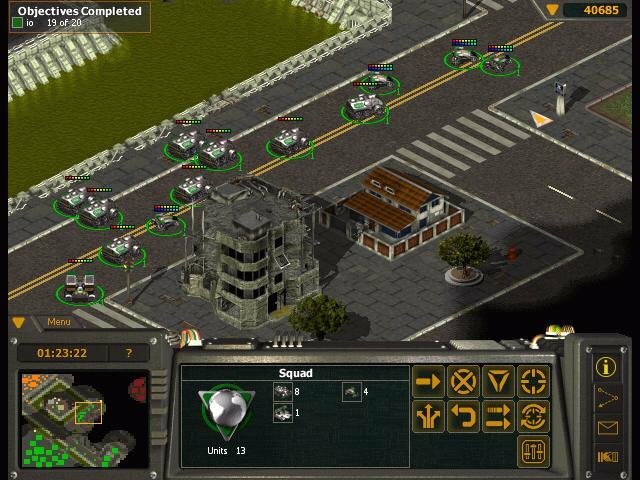 Worse still, it uses an isometric engine when all games of its pedigree were migrating towards 3D. And then there’s the generic sci-fi theme with the throwaway plot. But of course being a StarCraft clone isn’t a terrible crime, but being a mediocre one sort of guarantees everlasting obscurity. There’s a story tucked away in there somewhere, offering a vague excuse for two factions to wage war against each other (genetically altered humans versus sentient robots in this case). The game’s first two campaigns will have you play exclusively as each side, with a third ‘cooperative’ campaign mixing things up towards the end. 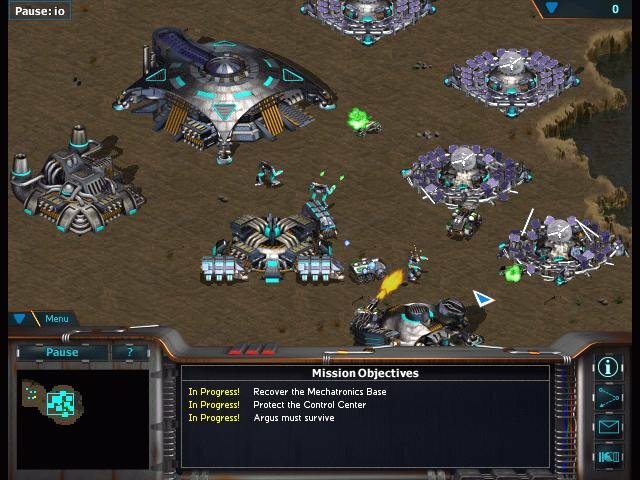 Multiplayer and skirmish modes are also available, and come packaged with a large number of maps. 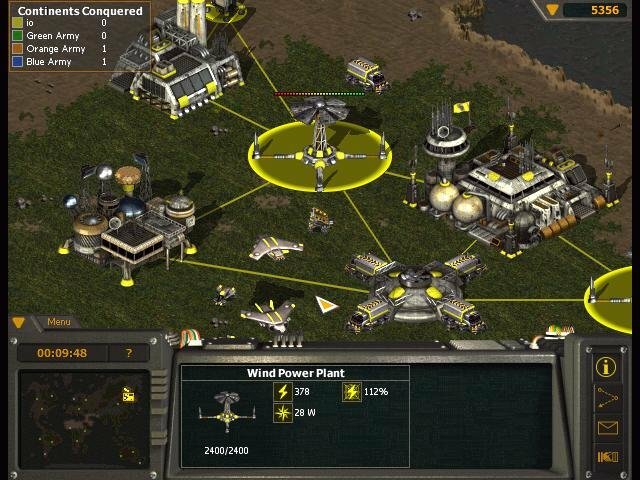 Bases need lots of power plants to function. Controlling the action is made easy thanks to the flexible interface – hotkeys are easy to grasp, the unit info panel spells out everything and the advanced AI options a welcome feature. 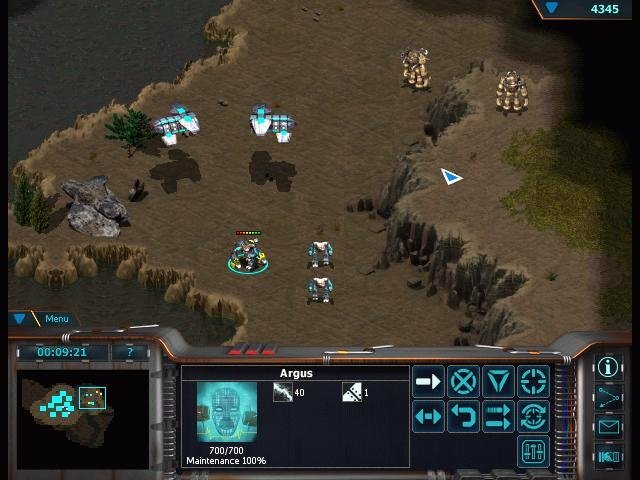 The only glaring mistake is the lack of an idle builder button or key (made more frustrating by the fact that all units sort of blend into the scenery). Gameplay is standard fare with several structural and combat curiosities thrown in and plenty more ripped off. Base-building is centered on constructing mining facilities atop resource mounds (of varying levels of purity) which your harvesters then extract and ship off to the refinery for credits. 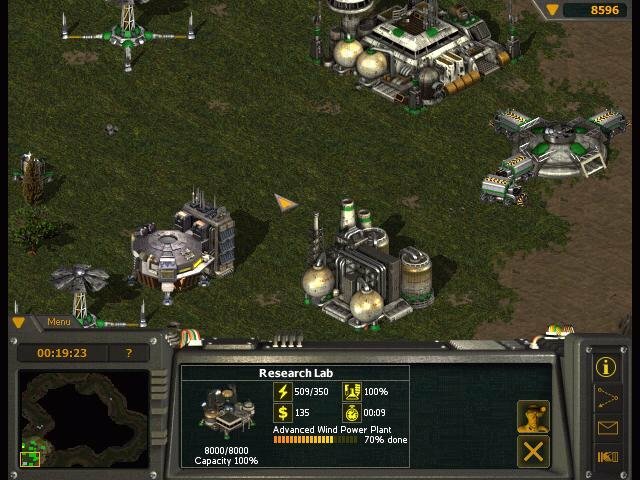 Some buildings and most units (air and land-based) are locked by default, which brings to light the game’s fairly standard research tree. 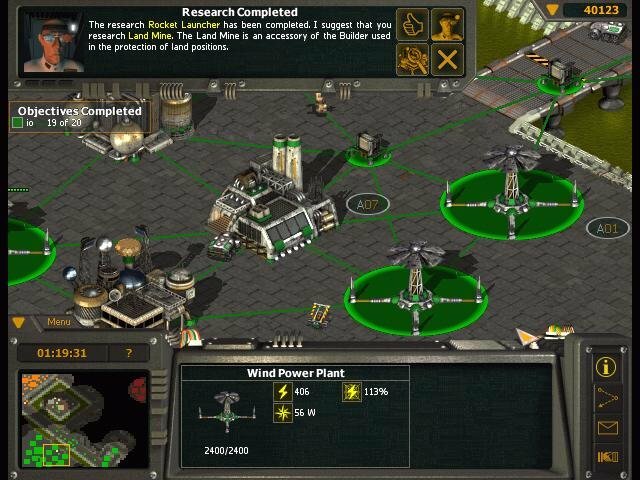 Research options help to improve your buildings and units in numerous ways, and the range of stuff you can upgrade is pretty diverse. 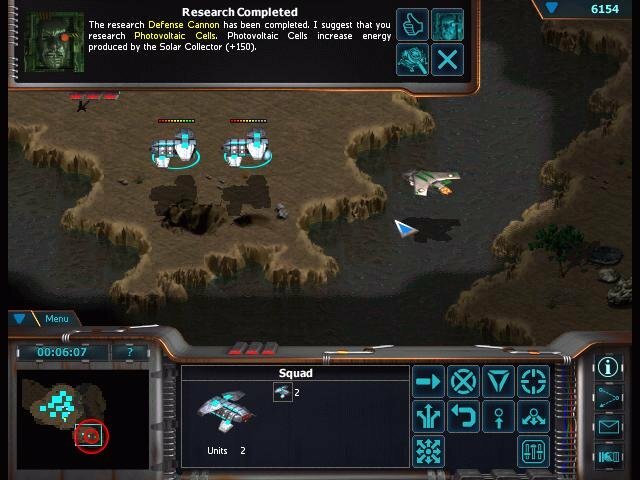 Unfortunately you can’t stack your research options, and an aggravating pop-up scientist will constantly badger as to which option he thinks you should fund next. 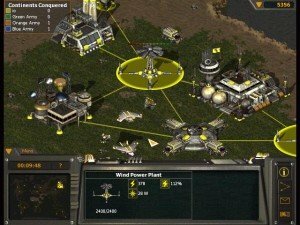 One other concept adding some depth to base building is the game’s power model, which you can actively measure – you have a serious power grid to sustain, comprised of wind turbines that run better on higher ground or nuclear plants that you wouldn’t want blown up. Bases that are underpowered still operate, but at a much lower efficiency rate, translating into longer production waiting times. Real-estate is always an issue, and you’ll sometimes find yourself building power stations outside your immediate perimeter and hooking them up via power transmitters. Not very much variety between levels. As with most games of its ilk, large-scale engagements can degenerate into confusing frays where it’s almost impossible to distinguish what’s going on. 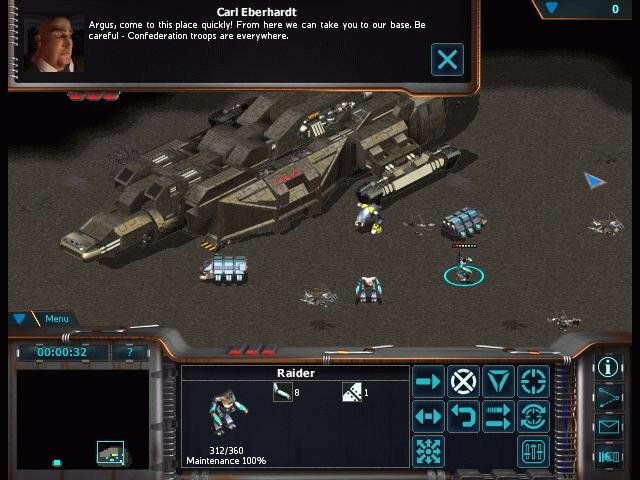 Outlive at least sports a speed slider to better control the action, and units have several AI options as well, such as the ability to plot precise patrol paths around your base or to adjust the AI retreating stance. 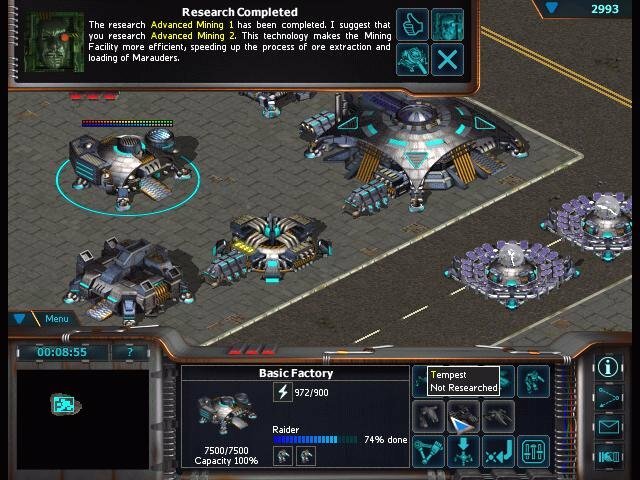 The latter is quite useful, allowing units that are low on health to automatically run back to the safety of your base where they very slowly auto-repair (something we’ve already seen in Dark Reign). And you can scrap destroyed units for credits (Total Annihilation). 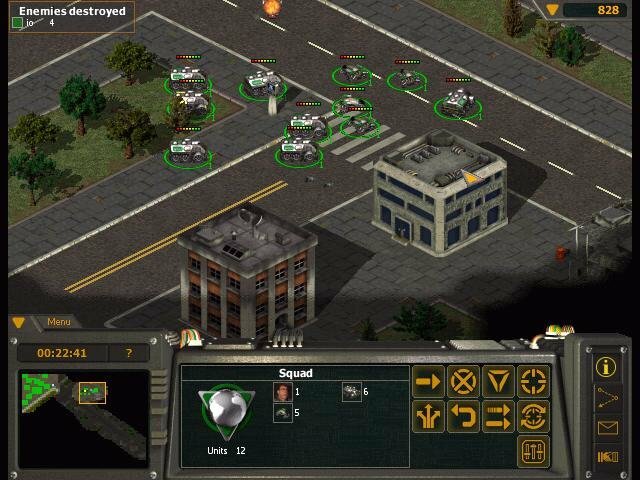 Combat is unmistakably simple here, and you’ll never need to dive into any finer tactical considerations beyond ‘left click on enemy unit to attack’ whilst keeping your economy up and running. That last bit is important, as keeping units operational isn’t free – every unit needs a small flow of cash for maintenance. You can cheap out on this and cut costs via the maintenance slider, but doing so will make your combat units slower and less efficient. This is an interesting take as it forces players to seek out extra resource points to fund larger armies for concentrated attacks. But it also leads to stalemates where players seesaw over resource points. Resources don’t have a numerical value, but rather degrees of purity that lower as you extract. 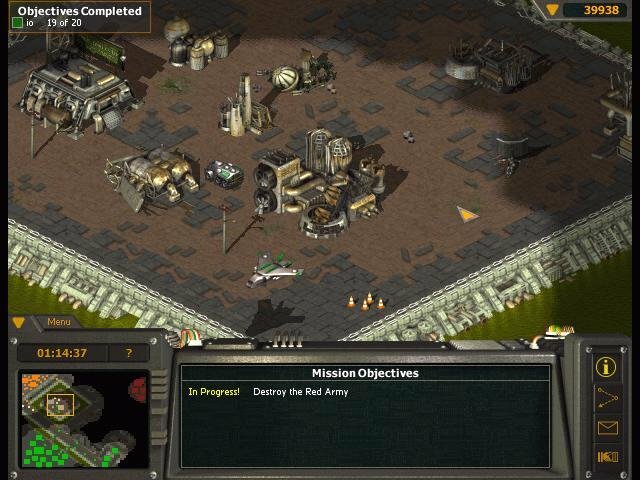 Outlive is somewhat of a curiosity, being more of a throwback to a previous RTS era in a time when major strategy companies (Blizzard, Ensemble, Westwood) have all gone full 3D with their games. 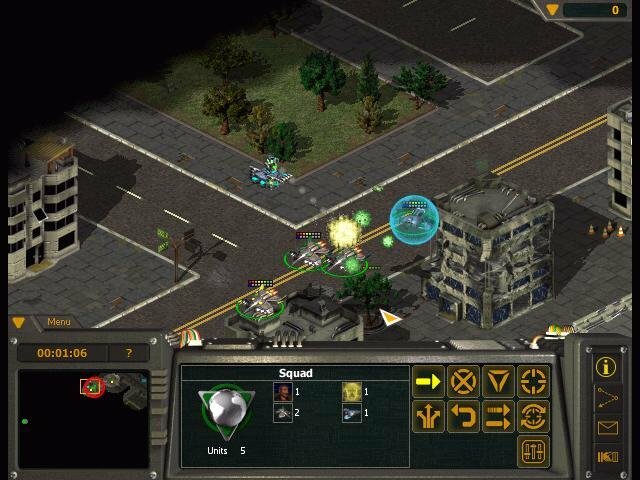 The visuals look like a cross between C&C and StarCraft, but with only two tile sets (urban and forest) and almost indistinguishable combat units. Take a peek at the credits and you’ll see that Outlive had a remarkably small development team, comprised of about six people. Considering the game’s scale, that’s quite a massive effort, and may also help explain why Outlive is so faulty at times. Ridiculous review … I hate it! 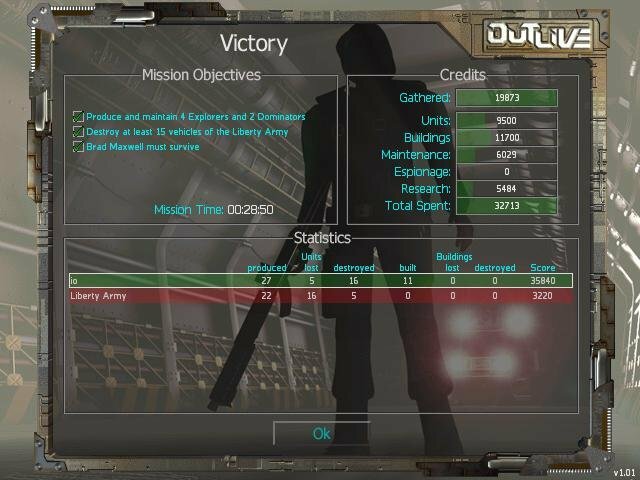 This game wasnt made by a company but by a few guys in a garage, I think the result was quite satisfactory. 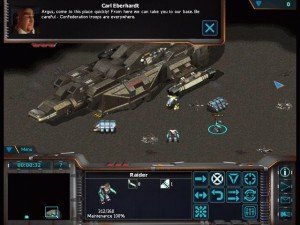 Rediculous review, Outlive was the game I grew up with and brought me into the genre of RTS, I was quite sad for many years when I couldn’t find any like it (Till I found Starcraft II) I have played the campaign many many times and have gained more hours out of it than many other games. I didn’t have multiplayer, when I started to play, the servers were down and never came up again. But the A.I is great and I happened to love the style and gameplay. Seeing how this game was made by about 6-8 people I say it turned out fantastic. Its sad to see they didn’t make any more games. I don’t agree with that review. I played this game since i found in his demo version in a magazine. 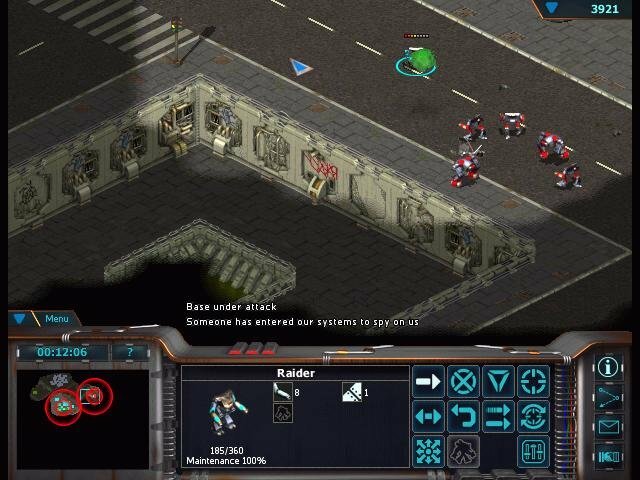 While i agree that it uses same kind of layout that starcraft, the units and design are well polished. Its map editor is amazing and very easy and friendly to use. I built many maps for a custom campaign. 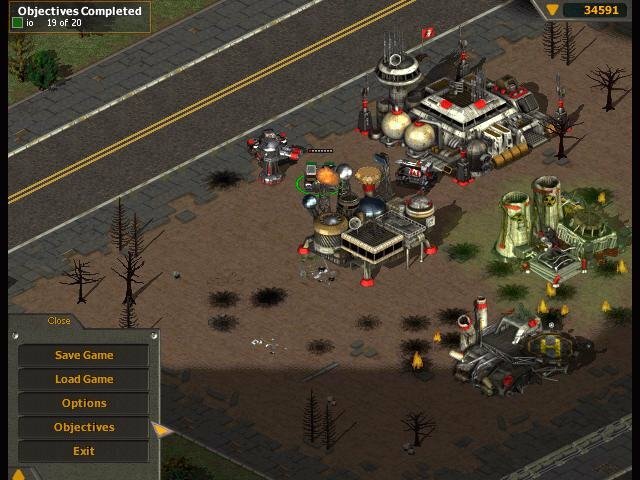 One thing that i think it was bad, is the unit limit and the game files that i never managed to build a mod for it. In newer computers the scroll speed is really fast, making it boring to walk on the map. Ridiculous review. I completely disagree. cant agree with this review. with all the respect, it’s too simple and focus basically on its similarity with the concorrence, ignoring some inovative ideas like the spy (that theres nothing to do with starcraft’s ghost) and industrial espionage and sabotage. this game has one of the most creative I.A that I have see in my life. i remember when this game was released and I couldn’t got … That’s amazing game !!! try to create a directory yourself and select it? i have tried it but same problem maybe windows 10 dont support this game? You can also use utorrent and press green button.